Early glimpses of what’s to come in the parks and resorts of Walt Disney World are some of favorite pieces to uncover. In these pieces of concept art I’m not so much looking for how similar they look to the final production, but more so for what’s different. Today, we’re standing in Japan as it planned to appear in 1978 and looking out on a very different World Showcase and Future World. Let’s start with what did come to fruition. Japan still has its most recognizable landmark, the torii gate. It also has the banners, native foliage, bridges, and stone toro lantern. Beyond the gate, there is still a dock and Friendships, Mexico’s pyramid is still standing tall, and Spaceship Earth, albeit in its more reflective, less tactile triangles, form is also present at the front of Future World. In just Japan alone there is quite a bit of change to notice. While the pathway looks familiar, and the garden area is critical to the landscape of the pavilion, the entrance way to Japan in much more structured and open than what we see here. The most obvious change is the large ship that has become marooned on the shore. Less noticeable is the fact that guests could have gotten all the way to World Showcase Lagoon if they felt so inclined as there were no guard rails. Though I suspect this was more for the aesthetics of the artwork and in actual practice there were always plans for handrails. Moving on around World Showcase, you can see a windmill sitting off to the left of the Mexico pavilion. Look inside of the torii gate for the windmill for a Denmark pavilion. The location of this pavilion would switch to the opposite side of Mexico, but would never get further than a set of restrooms that would one day become Norway. Of course, the biggest change is sitting across the lagoon in the large white structure. There has never been a large building sitting on the border between Future World and World Showcase, but once upon a time there was a very different plan. Using modern architecture this was going to be the location and design of the American Adventure pavilion. It was eventually decided that it would be best if the host country’s pavilion sat alongside all of the other pavilions of the world and took on a more traditionally American look. 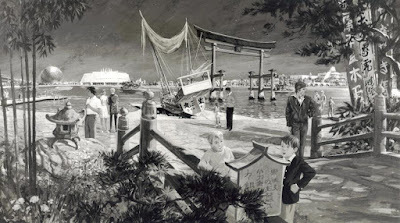 It was moved across the lagoon to beckon guests from Future World to make their way around the promenade to take a look. All in all, you never quite know what you’re going to find when you dive deep into a piece of concept art for Walt Disney World. 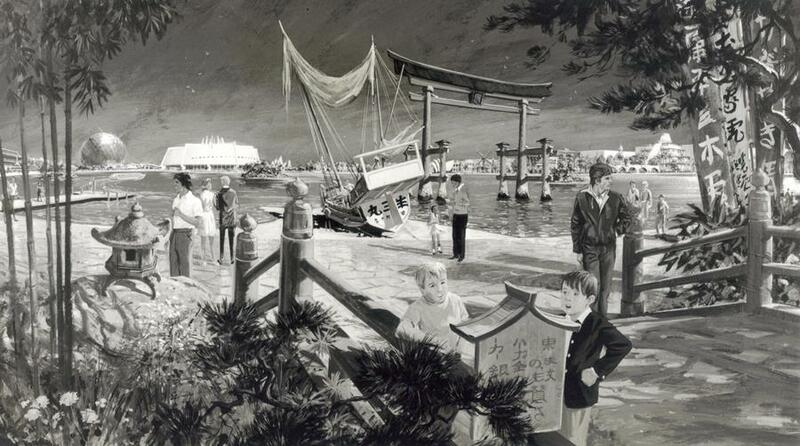 This view of World Showcase and the offerings of Japan made have changed from what we see here, but the heart remained. What do you look for when you come across concept art from the early plans for the Vacation Kingdom? I always notice that nobody in Disney concept art wears any Disney character clothing.